Master, Bachelor and first-level professional higher education programmes implemented by the Institute of Civil Engineering and Real Estate Economics of the Faculty of Engineering Economics and Management of Riga Technical University ensure internationally competitive high-quality scientific research, higher education, transfer of technology and innovations, as well as educate and train competitive and high-quality specialists demanded in the international labour market who are specialising in construction business and real estate management, business management and valuation, and working not only in the regional market, but also in the international market. Under the guidance of professional academic staff members, Doctoral Theses are developed and defended, as well as Doctoral Theses related to the issues of real estate, construction, territorial development and urban planning. 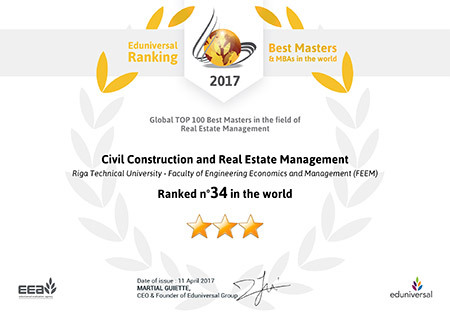 In the 2015/2016 academic year, according to the Eduniversal Best Masters Ranking the Master Professional Study Program “Civil Construction and Real Estate Management” ranked 35th among the 100 best study programmes in real estate all over the world. A person engaged in real estate transactions – engineering-economic valuation, management and administration, attraction of investments, etc. – should be competent in all issues related to the property administrative management, maintenance, use, valuation, accounting and other types of calculations, regulatory compliance, housing, tax, labour law, commercial activity – performance of contractual obligations, by ensuring the provision of utilities, execution of lease, rent, insurance contracts, physical management of property – development of real estate, renovation and maintenance of the apartment, house, land. The reference to the ranking is available HERE.